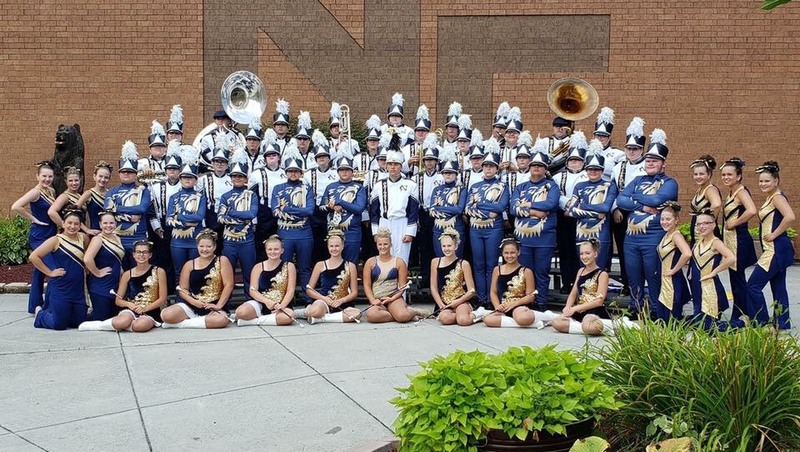 Throughout the 2018 season, the NCHS Marching Band did exceptionally well in numerous performances. The band is made up of 65 students, including the field commander, color guard, majorettes, and feature twirler. This year, The Heart of Nicholas County travelled to away games, and attended home games, along with 5 competitions, parades, and school functions. Including the diverse students, the band is made up of a huge support system. The parents and other family members never fail to stand behind the students. Hannah Dorsey, a senior color guard captain, said, “The unsung heroes of the band are the hard-working parents and Band Boosters.” The support system was always providing food, water, and most of all congratulations for the band’s success. Alex Rose said, “Every section of our Marching Grizzlies works exceptionally hard and we are always rewarded for all of our hard work.” This statement can be supported by the following list of performances, awards, and accomplishments. chair Trombone for the 2nd year in a row.